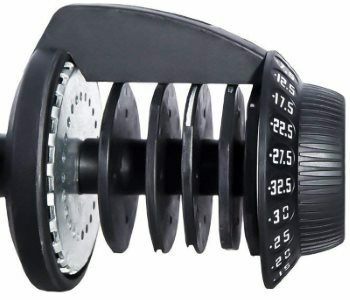 Home > Blog > Reviews > Merax Deluxe Adjustable Dumbbells Review: Are They Worth It? In this Merax Deluxe adjustable dumbbells review, I'll analyze all the important features of this popular adjustable dumbbell set. 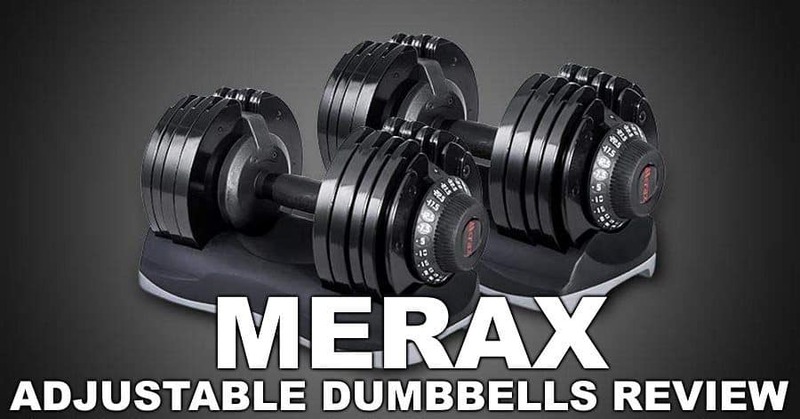 Are the Merax Deluxe Adjustable Dumbbells Worth it? The trays are well built. They hold the plates securely, so that the plates remain stable and upright when lifting the dumbbells out or putting them back in the trays. And unlike the flimsy trays that are commonly seen with lower quality selectorized dumbbells, these are durable and won't chip from normal use. There is also a dumbbell stand available, which holds the trays at a convenient height. This way you don't have to adjust and pick up the dumbbells from the floor. You can buy the stand with the dumbbells in a bundle. Or you can buy the stand separately later. The stand has wheels, making it easy to move it around your home gym if needed. The Merax Deluxe adjusts from 11-71.5 lbs per dumbbell. The max weight is quite impressive as far as this style of adjustable dumbbell goes. It should be sufficient for all but the most serious home gym lifters. The 11 pound minimum weight is a bit higher than many sets, which start out at 5 lbs. However, most of those other sets max out at around 50 lbs or less per dumbbell. The way this type of design works is that high max weights = higher minimum weights. In any case, most people considering this dumbbell set likely don't need dumbbells less than 11 lbs very often. NOTE: The dial shows the weight in Kilograms (kg), so it may be useful to print out a conversion chart if you're not familiar with the metric system. Each dumbbell adjusts in increments of 5.5 lbs (or 2.5 kg, as shown on the dial). The weight on the left and right side will be distributed evenly at every increment. Similar dial-based dumbbells let you to adjust the weight in ~2.5 lb increments. However, that's because on those models you can adjust each end independently, and thus can get the smaller increment by loading the weight unevenly between the left and right side (e.g. an extra 2.5 lbs on the left side compared to the right). The Merax Deluxe system use a dial-based selectorized adjustment mechanism to change weights. First, you press the red button near the top of the handle. This unlocks the weights. Then you turn EITHER of two dials to the desired weight setting. That's it. You're ready to pick them up out of the tray and begin lifting. This particular dial-based selectorized adjustment system is slightly different than others. First, there is the red unlock button; most similar adjustable systems don't have that. The second, and more major difference is that you only have to turn one of the dials on each dumbbell; most similar systems require you to adjust the dials on both ends. 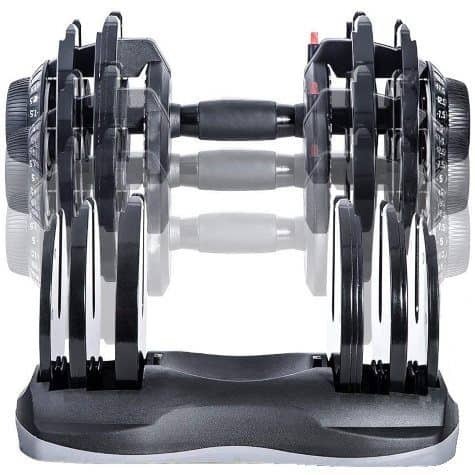 This means you can adjust the weight about twice as rapidly as on a comparable set like the Bowflex 552 or 1090. Yes, you still have to press the red button first, but that takes literally less than a second. The only downside to adjusting with just one dial is that you can't make the the weights uneven on one side to cut the increments in half. The dials on the ends are rubberized which makes it more comfortable when resting the ends on your thighs when setting up for dumbbell bench press or shoulder press. Everything in my deep research of this product points to it having overall very good quality and durability for a dial-based selectorized dumbbell system. It's still going to have all of the issues that come from any dumbbell set with the same basic design. Specifically, it has a lot of smaller, moving parts, including some plastic ones -- as such, there's a high risk of one of these essential parts breaking if you drop it. As long as you're okay with not being able to be rough with these dumbbells, you should be satisfied with their quality. Reports of defects or premature parts breakdown from normal use are very rare. 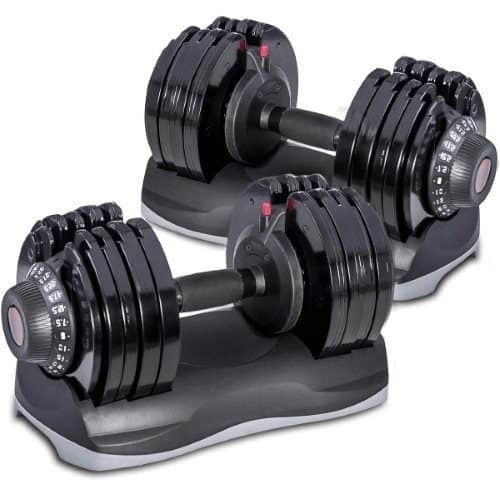 Some customers even consider these Merax dumbbells to be a small step above the better known Bowflex models (552/1090) that they're competing directly against. Any adjustable dumbbell system with this type of design is going to have some plate rattling. That said, I didn't hear any complaints about them being overly loud or unstable, which tells me that any rattling is minimal. 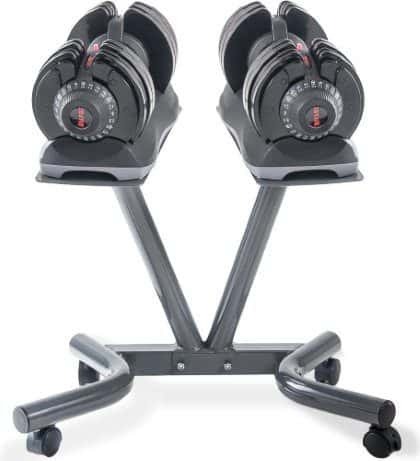 Many customers have praised the Merax Deluxe adjustable dumbbells as being very well balanced. This is certainly the case regarding weight distribution between the left and right side, since it's impossible to load these dumbbells unevenly. It also appears to be well balanced between the top and the bottom of each dumbbell, since there were no complaints about it being "bottom heavy", which is a common criticism of similarly designed systems. That being said, any adjustable dumbbell system where the plates have notches in them to allow the handle to be inserted, will have a slight imbalance between the top and bottom. This is because there is a piece "missing" from the top of each plate. The Merax dumbbells seem to have mitigated this imbalance with a good design where the notches are as narrow as possible. Additionally, the bottom of the plates are flat, which goes a long way in minimizing the bottom-heaviness of the dumbbells. Dumbbell length is 16.4 inches at every weight setting. Its length does not change when you add or remove plates. As such, when you're using lighter weights, the dumbbell will feel excessively long and may get in your way on some exercises. This flaw is inherent to any dumbbell set with a dial adjustment mechanism. Handle is contoured, meaning thicker in the middle and tapers to a narrower diameter toward each end. It has a rubberized grip coating over portion of the handle that you grasp onto. I've read that the handle material underneath the rubberized portion is metal, but I can't confirm 100% that this is the case. The first thing you should ask yourself is, do you want a dial-based selectorized adjustable dumbbell system? This type of adjustable dumbbell system is excellent in terms of rapid adjustment speeds, ease of use and design factor. However, it can feel too long for some exercises, and must be handled with care since it has many small (and often plastic) parts that could break from hard impacts. If this is not the type of adjustable dumbbell system you want, or if you're not sure, then check out my adjustable dumbbells guide. However, if you do want a selectorized adjustable dumbbell system, the Merax Deluxe adjustable dumbbells are a strong choice. They work well, receive positive feedback from customers, go up to a respectably high max weight setting of 71.5 lbs, and are available for a surprisingly good price. ...However, the 552s only go to 52.5 lbs per dumbbell, whereas the Merax go all the way up to 71.5 lbs. That extra 19 lbs of capacity is huge in terms of how much more you can progress on dumbbell exercises. For me, this slightly higher price point is a bargain considering how much heavier the dumbbells go -- it makes the Merax set a no-brainer vs the 552s. The only reason to go with the 552s instead would be if you absolutely know you won't need dumbbells heavier than 52.5 lbs. The decision between the Merax Deluxe and the Bowflex 1090s is a bit harder than the Merax vs the 552. ...BUT, the difference in price is not small. You have to pay around twice as much for the 1090s to get those extra 18.5 lbs of capacity! So, you need to decide if 71.5 lbs is enough for you. If it is, great! But if you need more weight, you have to be okay with paying the extra $200 for the 1090s. Don't just get Merax pair because they're cheaper, if you'll eventually need to uprgrade anyway. You'll end up paying more in the long run that way. IMPORTANT: All of the above considerations in this section assume that you prefer the dial-based adjustable dumbbell system. While they have some major benefits - particularly when it comes to adjustment speed - there are other adjustable dumbbell systems out there to consider. Personally, I'm a huge fan of PowerBlock dumbbells and Ironmaster Quick-Lock Dumbbells. Those are easily the top 2 systems in my opinion. 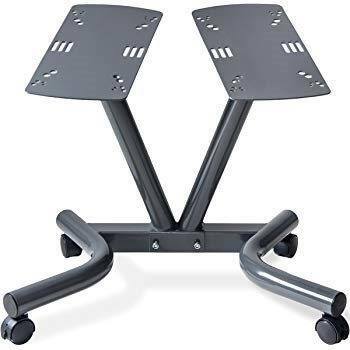 They both have high weight capacities, have excellent design and great construction, and they're durable because they don't have any tiny moving parts that could easily break. If you haven't looked at either of these yet, I suggest you do so (see here and here) before making a final decision. That wraps it up for this Merax Deluxe adjustable dumbbells review. I hope you found it helpful! If you've decided to get this set, you can view the product page below -- Enjoy your new dumbbells! Great review! – One of the Merax plastic trays has broken on my set. Any recommendations on how to replace the tray? Thanks. Thanks, Lance! 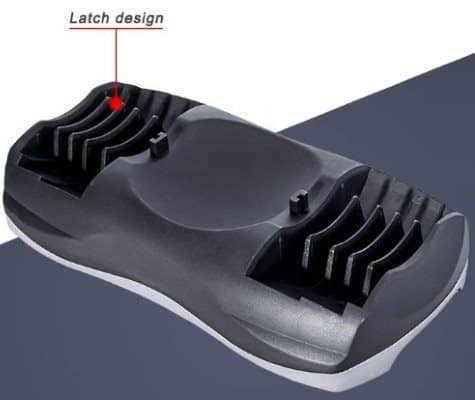 Have you tried contact Merax to see if they have replacement trays you could buy? In terms of a DIY fix, that would depend on the damage. If it’s something that would work if it was stuck back together, I’d recommend trying a good plastic adhesive glue. I’ve used this one different types of broken plastic items with good results before — you may also want to consider this one, which appears to be an even stronger agent that actually chemically melts two surfaces together for a true bond.